Though business world seem to have been smitten with social media marketing, nothing works better than email marketing when it comes to growing your small business. In fact, email marketing is perhaps the best way to build a rapport with potential customers. The Internet simply swarms with a host of free and easily available email marketing tools to help small businesses effectively reach and retain customers. 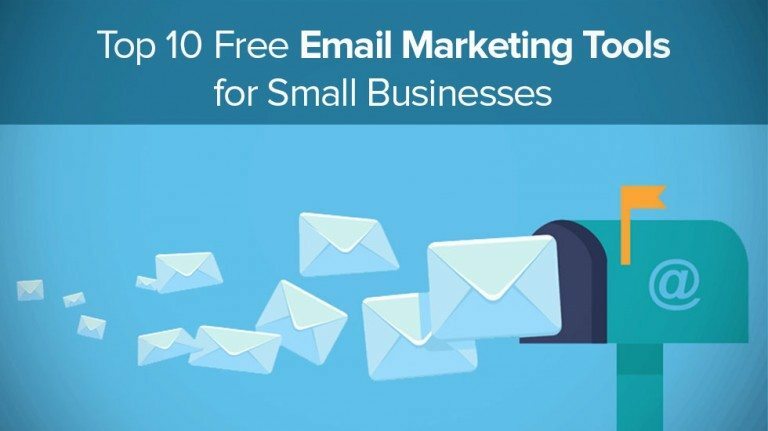 Here, we present to you top 10 free email marketing tools for small businesses. 1. MailChimp – This tool is one of the most used and most sought after email marketing tools by startups, small businesses and large corporations alike. MailChimp provides a forever free plan for up to 2,000 subscribers and 12,000 emails per month. What makes it so special is its relatively huge integration list, which allows it to integrate well with WordPress, Twitter, Facebook, Magento, ZenDesk, Drupal, Google Analytic and Salesforce. MailChimp offers easy analytics to measure the impact of your email marketing drive. 2. Reachmail – Reachmail is yet another brilliant email marketing tools that helps small businesses reach out to their customers, garner nedia milage and build a solid user-friendly brand along their small business. It is free for up to 5,000 contacts and 15,000 emails per month. Not only does Reachmail provides free email marketing tool, it also provides free training and unlimited support. 3. SimplyCast – SimplyCast is another some of the brilliant email marketing tools that provides excellent SMS marketing support and event management support. It is free for up to 2,000 contacts and 30,000 emails per month. This tool allows you to integrate your email marketing campaign with social media. In addition, it offers a host of creative custom email design templates to make it easy for you to take your pick. 4. VerticalResponse – VerticalResponse is free for up to 1,000 email contacts and 4,000 emails per month. This tool offers easy social media integration and social media scheduling features for unlimited posts on Facebook and Twitter. This tool can easily be integrated with a variety of CRMs. 5. Elite Email – Elite Email is one of the best mass email marketing tool in its class. It is free for up to 500 contacts with unlimited email sending. With its Geo map feature, Elite Email helps you track where your customers are and where they’re engaging with your emails. 6. ActiveTrail – Consistently ranking amongst some of the best email marketing tools, ActiveTrail is free for up to 500 contacts, and up to 2,000 emails per month. It includes automation features such as auto-responders, online surveys and landing pages. In addition, to make it esy for you to make your customers feel special, this tool send notifications to your contacts on their birthday/anniversaries, registration confirmation and password recovery. 7. CampaignMonitor – CampaignMonitor provides free account for up to 500 contacts. You may use this tool to create and build creative and professional email designs that are sure to make recipients fall in love with your small business brand. CampaignMonitor does not insert its own logo or branded links in your emails keeping your emails utterly professional. 8. Benchmark – It is yet another best email marketing tools that focuses on simple email marketing. With features to creatively customize email templates, Benchmark helps you impress your customers and subscribers with creative email designs. This tool also you to send up to 10,000 emails per month for free. What makes it so sought after is its user-friendly and clean email templates. In addition, you may use Benchmark to try your hands at video email marketing tactics. 9. ActiveCampaign – ActiveCampaign is yet another tool that makes it easy for you to effectively reach our to your prospects and customers with uber creative emails. This tool provides you with a host of features and functionality to such as web content triggering new email campaigns or features to get details about your email contact’s age, gender, social profiles, and more. ActiveCampaign offers you a free account up to 2,500 contacts. 10. CakeMail – It is a free email marketing tool that makes it easy for you to effectively market your products and services with simple yet creative email designs. Free for up to 2,000 contacts and 12,000 emails per month, CakeMail also offers a comprehensive mobile app for Android and iPhone. Looking for Customized, On time, Email Design? Launch a Email Design contest today. Choose from 100+ designs. Take your pick! Previous Previous post: Facebook vs Twitter – What’s Better for Small Businesses?